How have you been doing? I hope you all are well! Today I'd like to present to you a very special guest! I am a HUGE fan of her books and she is gracing us with her presence today on my blog! Not only that, she is sharing a BRAND NEW excerpt here first! It's a never before seen read! I'm doing a happy dance right now! Joining us today is New York Times and USA Today Bestseller and author of the highly popular Kowalski Family Series, Shannon Stacey! Hi, everybody! Falling For Max, the ninth book in my Kowalski series, is kind of my own spin on My Fair Lady, the classic musical that’s one of the few movies my younger sister and I don’t agree on. (She loves it. I love almost all of it.) Max Crawford has decided it’s time to start putting himself out there in hopes of finding a wife, but he’s a little shy and not exactly smooth. Tori Burns, after watching him strike out, decides she’s going to help him out. But the more time she spends with Max, the more she realizes she likes him just the way he is. 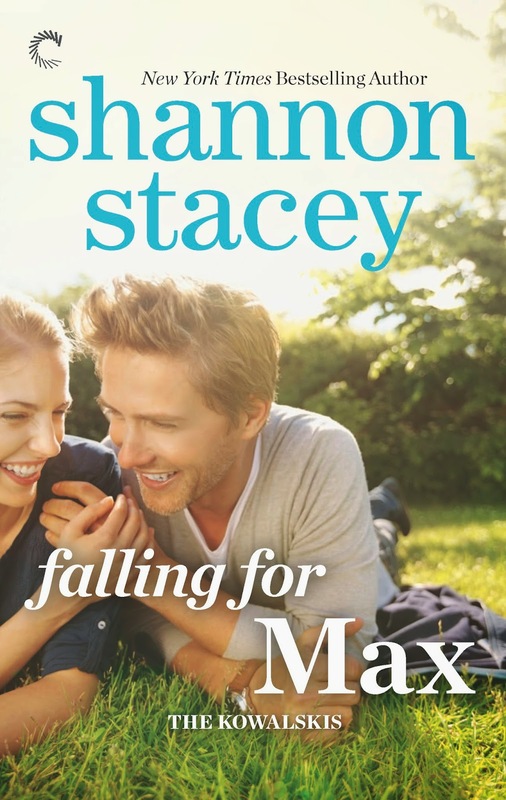 Here’s an excerpt from Falling For Max, which releases on July 29th, so you can see why Tori thinks Max needs a little help in the dating department. Poor Max. I hope you enjoy it, and happy reading! Max had often heard Laundromats were a good place to meet women. He wasn’t sure why, since he wasn’t one to speak to strangers while folding his underwear, so he didn’t imagine women would be any more comfortable doing so. But he’d tried it anyway, using a comforter that didn’t fit in his washing machine as an excuse to spend time in the town’s only Laundromat. After spending ninety minutes listening to the life story of a man who was newly divorced, Max had decided the rumor of Laundromats being a good place to meet women was probably started by a Laundromat owner. So he was back at the diner, perusing the menu and working up the courage to talk to the woman sitting further down the counter. She looked vaguely familiar to him, and he’d finally placed her as the woman who owned the secondhand store near the bank. He’d seen her on the sidewalk sometimes, setting up sale racks, but he’d never spoken to her. And even if he’d ever known her name, he wouldn’t have remembered it. She wasn’t wearing a wedding ring. Granted, that didn’t mean much, but it’s not as if he was going to open with your place or mine? Casual conversation would give him plenty of opportunity to clarify her relationship status before it came time to make a decision on asking her out or not. He’d left two empty stools between them. It seemed enough to respect her personal space, but not so far away they couldn’t have a conversation if she was so inclined. Assuming he worked up the nerve to speak to her. When Tori walked away, Max snuck a look down the counter. The secondhand store woman had dark hair cut into one of those smooth cuts that ended just below her chin. She was around his age and she was reading. It was a magazine, but that still counted. He also took note that her bill was on the edge of the counter, along with some cash, which meant she’d probably be leaving very soon. “No, I don’t. Sorry,” she said, glancing at him again, this time without the smile. Then she turned the page of the magazine and lifted it so there could be no missing the fact she was reading. Even Max could take that hint. Stifling a sigh, he tried to not think about how quickly he’d been shot down. He wasn’t sure what the average time was, but he felt like a guy should get more than three lines. Are you guys ready for another Kowalski Series book? Don't forget, it comes out July 29th! BUT pre-order it NOW! And make sure to keep up with all of her latest news! Thank you so much Shannon for stopping by today to share your new excerpt with us! The door is always open and you are welcome to stop by any time! This excerpt makes me wonder...IS the laundromat a good place to "meet" people? And where are some actual good places? Thoughts?